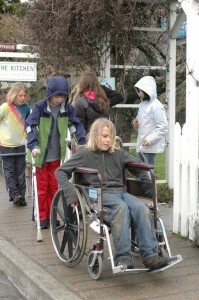 A recent walk through Eastsound provided an occasion for Salmonberry’s third, fourth and fifth grade students to notice a wheelchair-bound citizen struggling to navigate some of the difficult sidewalks and steps in the village. When they returned to class, students had questions about handicap accessibility and necessary accommodations for folks with limited mobility. Subsequently, Grace Grantham’s Letter to the Editor in The Islands Sounder decried the challenges of dealing with limited-mobility in Eastsound. With these two motivators – Ms. Grantham’s passionately written letter of frustration and their own firsthand observations, the students and teachers of Salmonberry’s intermediate grades class were drawn into further study. Their first stop was the Orcas Senior Center, where Barbara Trunkey provided a beautiful lesson on the many types of physical challenges faced by members of the Orcas Island community. She introduced the class to various types of adaptive equipment and their proper use. Thus the students got to try out canes, crutches, walkers and wheelchairs, and learned how to use them. The next day, the students headed into Eastsound. Here, students paired up and were given a particular “handicap,” an appropriate piece of equipment to assist their mobility and a simple errand to accomplish. In this way, students set off in wheelchairs to mail a letter; used a walker on their way to use the public restrooms; used crutches as they went off to return a library book. The experiential lesson on what it means to deal with a physical handicap or mobility impairment lasted for two hours. When all was said and done, students had a newfound appreciation for the real challenges faced by those with physical handicaps and limited mobility. Along the way, students had positive interactions with many curious island residents as they explained their project. They also had a lot of insights, which they hope to share with business owners, the Orcais Island Chamber of Commerce and the EPRC (Eastsound Planning and Review Comission) in the near future. “Doors were really hard. It’s much easier when businesses put in power-assist doors,” said Charlie Brady, age 9. “Some places were really slick. When I was on crutches I almost fell on the stairs up by the library,” said Tashi Litch, age 10. “That stretch between The Kitchen and The Homegrown Market where there’s no sidewalk and cars park right on the shoulder; there’s just no way to get through there in a wheelchair,” said Solana Zobrist-Mehl, age 11.